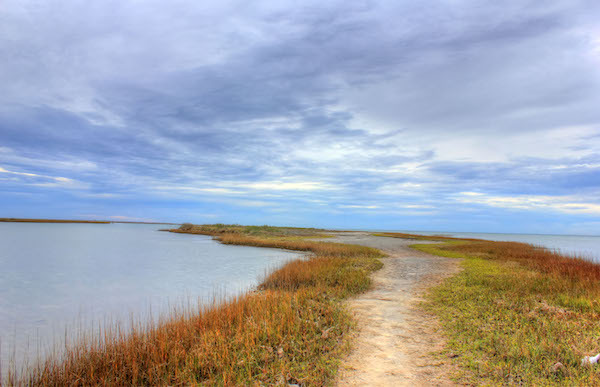 Galveston Island State Park is one of the best opportunities for a run away from the roads and crowds. Straddling both the beach and bay sides, the park has 4 miles of trails that are suitable for running. There are lovely views of the beach, bay, wetlands, and coastal prairie. This website has good information on the park, and an interactive trail map. The park is located about 10 miles southwest of central Galveston. The 4 miles of trails are overlapping, so you’ll have to combine them to get in a decent run. The longest trail is ‘beach to bay’ Heron’s Walk Trail, at 1.4 miles out and back. The attached trail map has excellent descriptions of the trails. Do a duathlon and enjoy some of the paddling trails! Add-ons. The beach is runnable in this area. The main road, Termini-San Luis Pass Rd., is OK but not great for running — there are some water views, but the road can be busy and has a narrow shoulder.